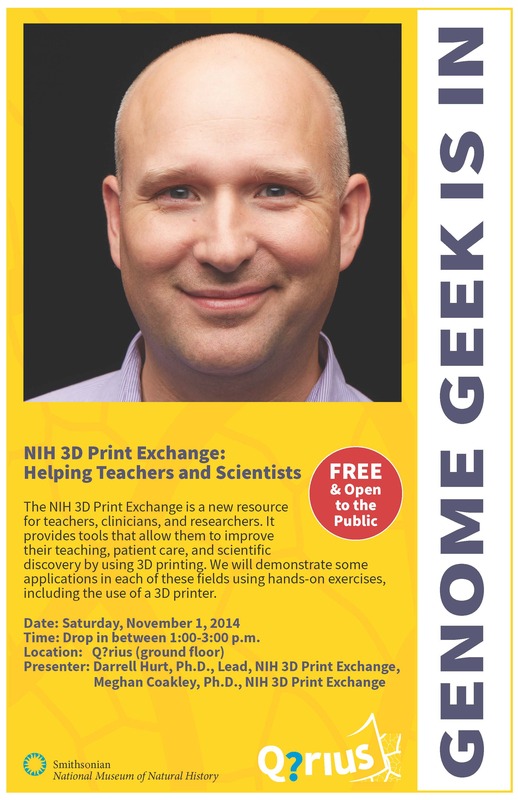 Meet some of the Geeks from the NIH 3D Print Exchange! Dr. Darrell Hurt and I will be presenting at the Q?rius program at the Smithsonian National Museum of Natural History, this Saturday, November 1st. Q?rius (pronuonced "curious") is a program for kids, families, and educators to connect science with everyday experiences. We will be demonstrating the immense value of 3D printing in scientific and medical discovery and learning. We will have some fun hands-on exercises, and you will even see a 3D printer in action! The event is FREE and open to the public - just drop in anytime between 1:00 and 3:00 p.m. Check the Q?rius events calendar to find more exciting activities at the Smithsonian.